Read here about Claude Bragdon, an American architect who influenced Buckminster Fuller and so, in turn, had an influence on the discovery of tensegrity. Claude Fayette Bragdon (August 1, 1866 – 1946) was an American architect, writer, and stage designer based in Rochester, New York, up to World War I, then in New York City. His books on democracy, fourth dimensional geometry, mystical thought and Yoga were well known in the Eastern United States and influenced Fuller. He was a highly infuluential architect, whose name faded when modernist architecture gained sway, partially at his expense. Bragdon's work often featured detailed, accurate perspective renditions of the platonic solids: tetrahedra, octagedra, icosahedra, and other higher-ordered forms. 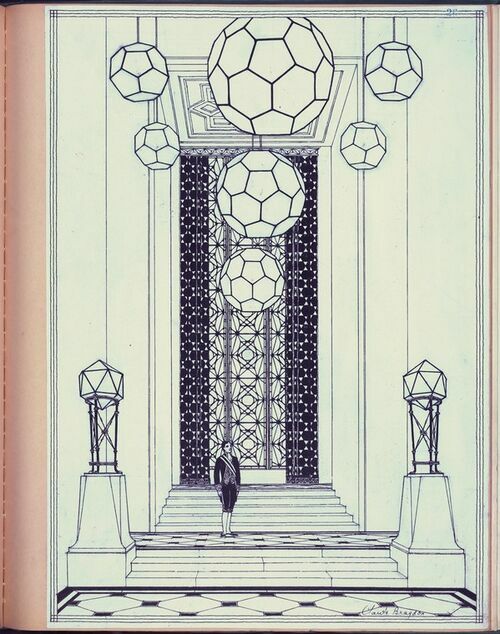 His focus in his work on the fourth dimension was in spatial projection, usually in order to generate sumptuary ornamentation for the built environment. The ornaments could be attached to existing structures like skin on bone. Fuller, on the contrary, sought new structural arrangements that would emerge from such geometrical constructs. Their form itself was the structure. Bragdon's interest in the fourth dimension had spiritual overtones, and he often spoke in metaphors comparing our inability to sense more than three dimensions with notions of higher yet inaccessible states of consciousness. A woman stands between two icosahedra, in the background a two frequency icosahedron is drawn, the pattern that is the basis of the geodesic dome. Bragdon popularized the platonic solids at a time when squares, cubes and rectangles dominated architecture. Bragdon explored variations and projects of the classic geometric figures. Bragdon's focus on ornament would become the weapon used against him, Sullivan and others as more severe modernist anti-ornamental styles took hold. Direct view axes, tilted view apexes, the 16 hedoird in plane projection. Figure 15, p. 115, Architecture and Democracy by Bragdon.